“If it should be done the WVS will do it”. Established in 1938 by Stella Isaacs, Marchioness of Reading, the Women’s Voluntary Service (WVS) for Civil Defence was there to assist the Air Raid Precaution Service during the Second World War. Often this meant setting up rest centres that could provide shelter, food and comfort to those who had been affected by the Blitz. In particular they also aided the evacuation of children from London to safer, often more rural, areas, such as Bedfordshire. They supported their fellow land army recruits, for example by making pies to help keep up their strength during harvest time. Often they provided refreshments for troops stationed locally. ‘British’ restaurants and Rest Centres were set up across the country to care for the displaced that the WVS managed. ﻿ In the Museum collection we have an example of one Bedfordshire woman’s WVS uniform, sadly we have not been able to trace as yet the original owner. The uniform of the WVS had to be designed in a hurry between April 1938 and the start of the war. The uniform was designed by London couturier Digby Morton and included a suit, blouse and overcoat. Lady Reading also managed to talk the head of Harrods into making and supplying them. The Hon. 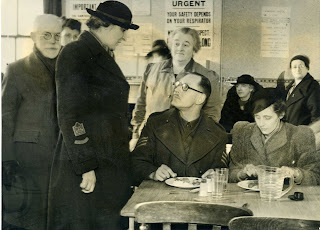 Pearl Lawson-Johnson escorting Lady Reading to the British restaurant in Mill Street. Both are dressed in official WVS coats and felt hats bearing the WVS badge. The coat and hat were for sale from 20 different outlets around the country at first. These were available to any WVS badge-holder, although it was stated that no one was obliged to wear the garments. By October a tweed jacket and skirt, as well as red blouses and WVS overalls extended the range. In December the embroidered badges, scarves and white overalls were launched at 229 shops, which were listed as authorised retailers for the merchandise. WVS Civil Defence embroidered badge with Bedfordshire name tab. Name tabs for counties and county boroughs were issued, alongside instructions on how uniform should be worn; “It should be complete and should not be mixed with ordinary clothes; brown low heeled shoes and no jewellery are advised”. There had been many enquiries for a suit in a lighter material for summer use, but wartime difficulties in the supply, dying and distribution of woollen and cotton materials, meant that it wasn’t possible. The solution to this was the launch of the official dress in green, manufactured to start with only by Lillywhites of London. By early 1942 all uniforms were administered centrally by the Ministry of Supply due to rationing. Material was provided for those who desired to make their own. The dress in our collection is a Utility dress manufactured by Brilkie. In the collection we have a group of photographs published by the Bedfordshire Times of a visit by the founder of the WVS, Lady Reading to Bedford in February 1942. She visited the British Restaurant, 36 Mill Street, at the old fire station. Lady Reading speaking to Sergeant Pedder. Behind the Sergeant is Miss Rogers. 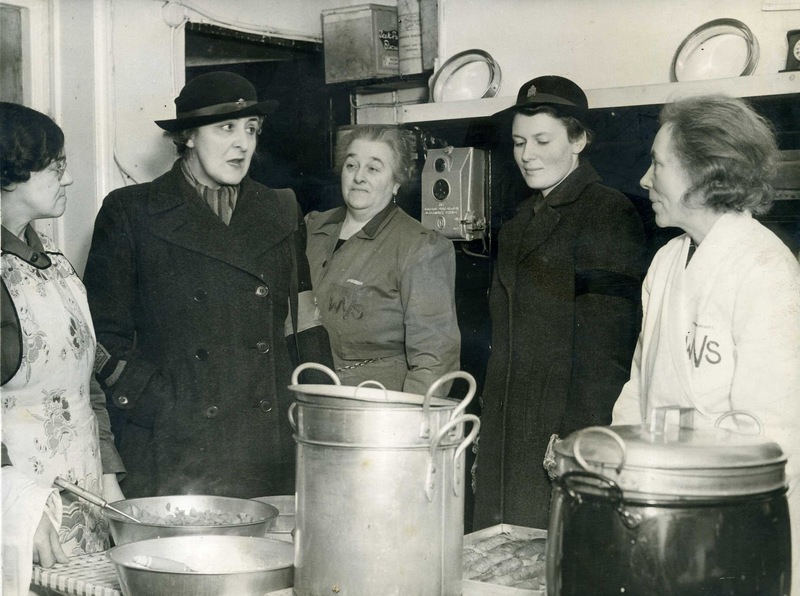 The WVS continued as an organisation after the war and changed its name to the Women’s Royal Voluntary Service in 1966, now known as WRVS, which continues to provide charitable assistance to those in difficulty. Lady Reading enjoying a hot bowl of soup at Bedford's British Restaurant. 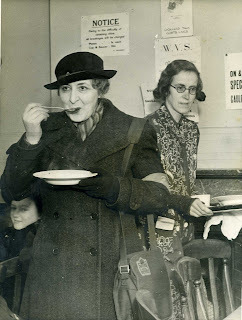 If you or someone you know have memories (such as enjoying a bowl of soup) at the British Restaurant or as a member of the WVS/ WRVS in Bedfordshire and their contribution during the Second World War, then please do share them with us on the blog comments, email chag@bedford.gov.uk, post on Facebook , post your pictures to our Flickr group, or Tweet. Thanks to Bedford's Times and Citizen for permission to reproduce the images of Lady Reading’s visit to Bedford in 1942. 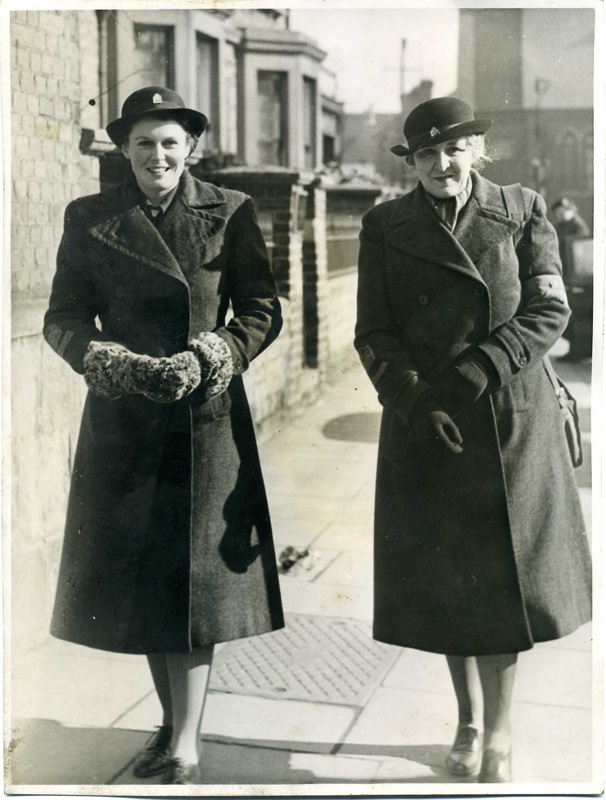 Thanks to information provided by WRVS and their factsheet WVS uniform, written by Matthew McMurray, WRVS archivist, http://www.wrvs.org.uk/Uploads/Documents/About%20us/wvs_wartime_uniform.pdf See link for copyright restrictions.